Today, our focus is on the film Captain America: The First Avenger starring Chris Evans as Steve Rogers. Of course, Richard Armitage plays villain Heinz Kruger. bccmee: How did your son get cast in Captain America? Adrian: He is on with an agent who specialises in Child castings. bccmee: Is he a trained actor? Adrian: No, he likes it, but doesn’t even do weekend classes or groups ! bccmee: Has your son acted before or since Captain America? If so, what movies or TV shows can we see him in? Adrian: Max hadn’t acted before (only school plays). He has auditioned for a few things since (the Lone Ranger with Johnny Depp- production was put on hold due to budget constraints), but nothing has come to fruition. He’s going to be playing “Toad” in a local stage production of Wind in Willows! bccmee: How did you, your son, and family like the movie? Adrian: We loved the film. bccmee: How did he acquire such a perfect American accent? Adrian: His Mum (my wife) is American. bccmee: Where was that scene filmed? Adrian: Liverpool, by the old docks. 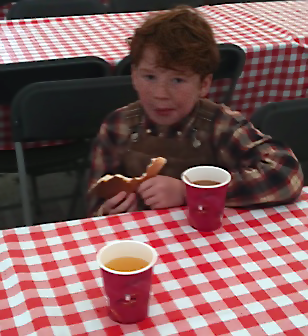 bccmee: Your son looks so cute in the photo with his tea. Was it a cold day on the set? bccmee: Does he really know how to swim? Adrian: Yes he swims well, and that was the major part of the audition (in the tank at Pinewood Studios – where a lot of underwater scenes are shot for movies) When he actually did the scene and got thrown in, it was quite a big drop, but Max did the stunt – there were two scuba divers waiting under the water just in case !! bccmee: What is happening in the stunt photo? Did your son jump onto the pads and then later the shot of him jumping into the water was filmed? 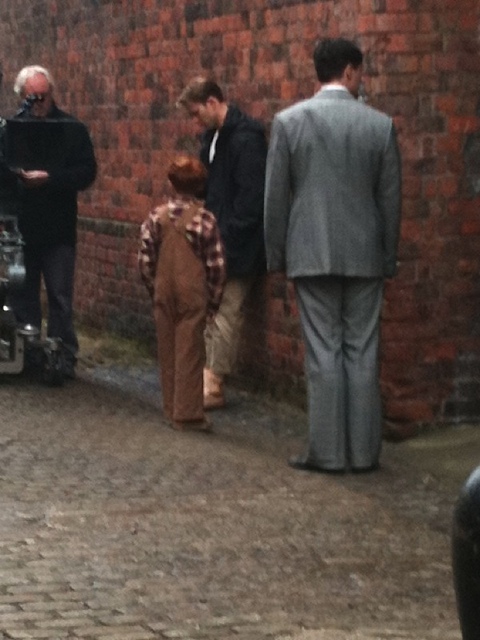 Adrian: He had a stunt double (a dwarf with a red haired wig !!) but he was only used, as it turned out, to line-up the shots/cameras; they threw the short guy in about 15 times – it was like something out of Jackass !! 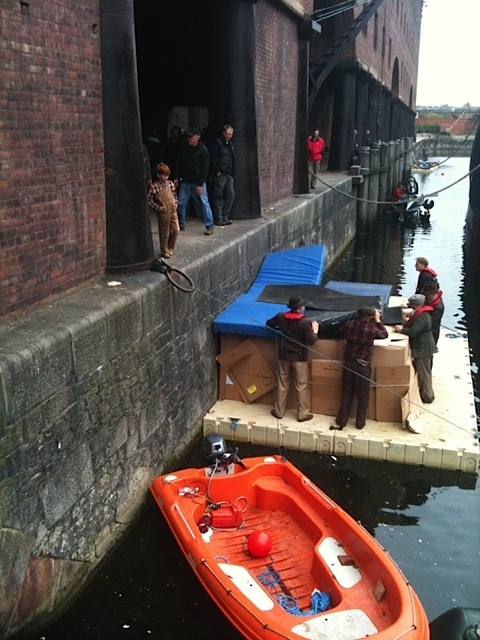 It was about a 15 foot drop into the water (the Mersey in Liverpool) which was cold as it was filmed in October. The water looked quite dirty with debris on the first day so I asked if they could clean it up a bit for the next day when they were shooting that scene. bccmee: He was thrown into the river and not a pool? Adrian: He was actually thrown by Richard into the river (his audition was at Pinewood Studios in the “big tank” that they use for a lot of movies, Harry Potter, James Bond etc.) They rehearsed by throwing Max onto the pads, but threw him in for real to get the best effect. There were scuba divers waiting under the water in case there was a problem. They made Max a special skin coloured wet suit to go under his clothing, but it didn’t really work properly, so he still got wet and cold ! bccmee: How many days did it take to shoot your son’s scenes? Adrian: It was scheduled for 5 days but took only 2, so the director was happy. When Kruger (Richard) grabs Max after shooting at Cptn America, he chipped Max’s tooth by accident – the gun is a close replica of the real thing, so is quite heavy. He was very apologetic but no harm was done. Adrian: His agent in the UK is Doreen English, who finds most of the kids for any Hollywood movies being shot in the UK/Europe. bccmee: Did you meet Richard Armitage on the set? Adrian: Yes we drove up with Richard from London together. Very nice guy, very professional. We stayed in the same hotel as him. Max has a picture with him at dinner. This entry was posted in FanstRAvaganza, Interviews, richard armitage and tagged actor, captain america, chris evans, fanstravaganza, heinz kruger, maxwell newman, richard armitage. Bookmark the permalink. Kaching!!! Way to go B! I knew you were being quiet for a reason. Excellent interview and great pics! Seriously, it’s no wonder we think RA is amazing – he IS such a nice person. Lovely shot of him with Max. Thanks for the info and interview, bccmee. Cheers ladies – FanstRAvanganza should be a fun romp! What a wonderful start to FanstRAvaganza! I had to read yours first! Lovely pics and a great interview! Oh my, RA chipped the poor lads tooth! And FanstRAvaganza 3 is just starting!!! Very good interview!! Thanks for posting it again (as I had not seen it before)!!! Guess I read your post too quickly and misunderstood it. In July you posted an interview with RA and now you post the interview with the young actor’s father… sorry!!! Amazing! That is one tough kid! If the parents are reading here, kudos on raising such a trooper! And yet more evidence that Richard Armitage is a great guy. Thanks so much for tracking down this interview. That was a great interview! Poor boy and the chipped tooth! He has some awesome memories and how cute is that pic of the two of them???? Richard is going to get quite a reputation! Didn’t he knock out one of Keith Allen’s teeth in Robin Hood and Hayley Atwell got too close to him and got hit in the side of her head with a blank shell?. Well done for getting this interview and the photos are a real treat. What a great way to start FanstRA! Wonderful surprise. Thanks bccmee. What a scoop! Wonderful interview and pix, B! It’s always interesting to know what goes on behind the scenes. This was great! Thanks so much!!! Awesome interview and pictures! Thanks for getting us the scoop. Wow, go B! What a way to kick things off! Richard seems to have really bad luck when it comes to get near other people’s teeth don’t he? Excellent interview, this really was a coup. That is one cute kid. And once again, confirmation of how wonderful Mr. A is. What a great coup Bccmee! and what a great gift to us all for FanstRA! Thank you! Richard is such a lovely man – more confirmation indeed and lovely photo with Max. And Max and his father two great guys as well. Oh to be in a car with RA on a drive from London to Liverpool – heaven! Wow!! Bccmee, thank you so much for sharing such a treasure! Very unique post! Something brand new we didn’t know a thing about. Thanks for a great kick-off to F3! Missed you! Glad to hear from you again. This is a fabulous “insiders” interview with the kid co-star’s parent! 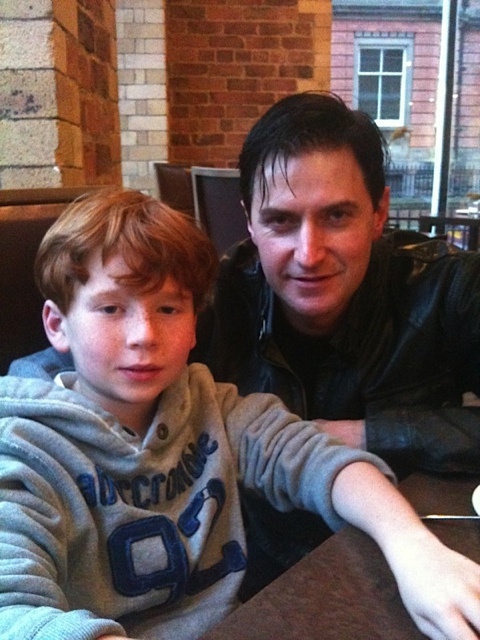 And I love the picture of Richard with the kid! More bursting ovaries, I’m afraid. Ha! What a wonderful event, FanstRAvaganza! Bccmee… our RA reporter. 🙂 Great post!!! This behind-the-scene research you did is really exclusive. And what can I say of the photos?? Lovely! And thanks Max and his Dad. It’s great to read and see something new about RA ! And Max is a real trooper being thrown in the Dock. Great start to Day One! Wonderful interview and Maxwell Newman seems to be an actor to watch. Thank you very much, bccmee! It’s amazing! Bccmee, thanks so much for this wonderful interview! And thanks a lot to Max and Adrian! It’s so great that you shared with us your vivid recollections and photos. A wonderful interiview! Max has lived our childhood dreams. And I can’t wait to see him (hear) him as Toad. You are filming the performance, yes, Max’s pa? AWWWWWWWWWWWWWWWWWW!!!! THUD THUD THUD!!! Thank You Bccmee!!! Wonderful interview B! How fortunate that you got to interview Max’s father. Max is adorable! @Everyone: I’m just popping in with a quick comment. Thanks for all your support and I’m really thrilled to be taking part in FanstRAvaganza this year! I’ve taken a look at most every blog and there is such an interesting variety out there. As a friend of mine said, there is not a dud out there! Might RA’s warning label be “Dangerous when wet”–or near water? Ha! Thank you so very much bcmee for sharing this interview and photo – what a lucky boy to have had that experience. How adorable! As if we need more proof of what a wonderful guy RA is! LOL. Just *one* question, hehehe! Did Max and his family tell you if they knew of or were fans of RA before they met him? I was just curious. Lovely pictures… thanks for sharing this interview… I really want to know, how bad it is to be jealous of a child? Great interview bccmee, thanks for sharing. Excellent interview! Thank you for sharing with us. Richard is indeed a wonderful man! Thanks for sharing this…..what a great start to fanstRAvaganza3! Great interview. Adrian sounds really cool, even though his son’s tooth got chipped! But nice to know RA was very apologetic about it….as we knew he would be! Great interview I was so pleased to read! Thanks to all concerned. Bccmee thanks for the brill interview. What a lucky boy Max was to have such a lovely photo taken with RA. Wow, great surprise bcc. I didn’t expect to find such a lovely interview with those great new pics from CA set. Well done, excellent job! Love the one with Richard and the kid, of course. I agree with all of the above comments! Did anyone else notice the identical pose of RA and the kid taken from behind? Sort of like a little school boy stance in his adult gray suit. SIGH. Thanks Bcc for great interview and behind the scenes shots. What a great interview! And isn’t the little boy just absolutely brave! Great surprise for our first FanstRAvaganza day B – thanks! I am just getting to this and what a treat, my girl. The little boy was certainly a trouper, undergoing all those tosses in the water. And how nice to hear it confirmed once more that RA is a truly nice fellow and a true professional. Bless his heart, I know he was chagrined when he chipped the child’s tooth. Maybe he SHOULD come with a warning label!! @Everyone: Thanks again for all your comments! RA definitely has a reputation for his professionalism. I think it’s a cute picture too and I really appreciate all the time and effort put in by Max’s dad. As I said in my post, Max is incredibly talented. I remember saying to my sister after seeing the movie how impressed I was. I hope Max has a long and fruitful career if that’s what he wants! Hi, Bcc.Thanks for this wonderful interview and the photos. Poor Richard ,I wonder how he must have been after the incident about the kid´s tooth. But he should come with a health warning 1st Keith Allen’s tooth 2nd Jonas Armstrong’s foot now Max’s chipped tooth. Thanks for the interview! It was really fun to hear from a “regular” guy about RA. The boy’s dad sounds very nice and the boy must have been a real trooper. I agree with Sapphire that RA needs to come with his own warning label! Lol. Such a great start and lovely pictures. And so heartening to hear further confirmation of Richard’s amiability. Fantastic inteerview. Well done BCCmee. What a great dad granting the interview. Sounds like little Max has a strong back up there. Well done little man. Bless RA all apologetic over the chipped tooth. Good to see he gets another thumbs up there.